Children & Youth in History offers sources about young people from around the world & across centuries, with a tremendously helpful guide to understanding & interpreting primary sources on children & youth. 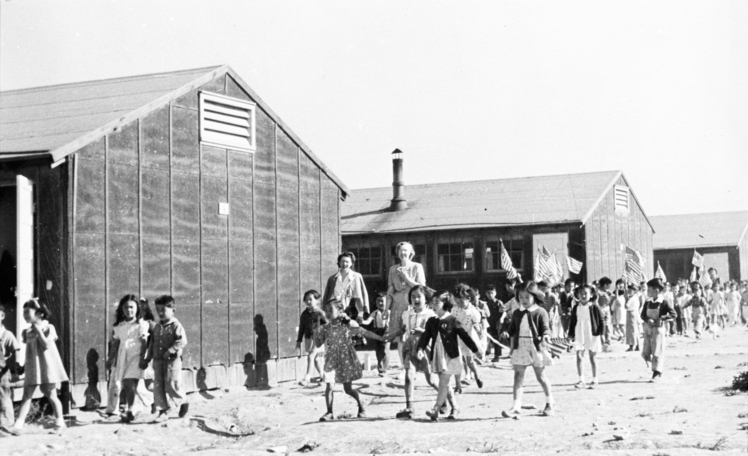 Image: "Schoolchildren, Minidoka incarceration camp, Idaho, 1940s." 5 volumes of short primary sources on a huge range of topics. Use the index in volume 5 to find topics. Newspaper articles from over 1000 historical newspapers, including ads, editorials, news stories, etc. A digital library of primary sources in American social history from the antebellum period through reconstruction, covering education, psychology, American history, sociology, religion, and science and technology. Over 30 19th-century schoolbooks digitized by the U. of Pittsburgh libraries, including McGuffey Readers. Material written for (and in some cases, by) American children in the 19th century. Primary sources on the education and inclusion of people with disabilities in primary, secondary, and higher education. Includes resources related to Gallaudet and Perkins. A full-text collection of advice manuals covering all aspects of social, political, cultural and professional life in the United States during the 20th century. Written and spoken words, sound recordings, still and moving images, prints, maps, and sheet music that document the American experience. Find additional research resources here, organized by place & time period. HathiTrust contains millions of digital books, journals, government documents, and other volumes, all digitized from research libraries. The collection includes both public domain and in-copyright works across a full range of subjects. Digitized versions of the Wellesley College course catalogue, 1903 - present. This Web site provides access to digitized versions of archival records and manuscript collections relating primarily to women's history -- particularly women's education at the Five Colleges. Included among the collections are official college publications, letters, photographs, articles, oral histories, diaries, and more. Browse through primary sources and view digital exhibits from the Bryn Mawr Special Collections. Documents the history of Radcliffe College (1879–1999), its students, alumnae, and the women of Harvard University. The Library welcomes all researchers whose work requires use of its collections. This exhibit presents digitized selections of key primary source materials, such as letters from students and women teachers, diaries of missionary teachers, various schoolbooks, sermons, and catalogs. Manuscript materials have been transcribed. Searchable database of 150,000 pages of letters and diaries, drawn from journal articles, pamphlets, newsletters, monographs, and conference proceedings. Part of the Open Collections Program at Harvard University Library, this is a great place to look for primary sources of women working in the late eighteenth, early nineteenth century. The digitized collection includes: books, pamphlets, images and some manuscripts. It is easy to browse or search the collection. Premier international collection of digitized material (1543-1988) on the evolution of a feminist consciousness and the movement for women's rights. Find a good secondary source, and work backwards. See what primary sources the author consulted, and search for them (you will probably find other relevant sources this way). Tips for finding primary sources from the Library at UC-Berkeley - Includes information about finding particular types of sources and searching with information you already have.